I got a little motivated to work with some of my 2006 photos. I took over 1600 shots on this trip and I often don't do the editing work I need until much later. 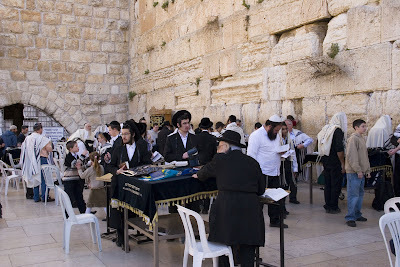 So, here are some shots of one of the most interesting places in Jerusalem – the Western Wall. 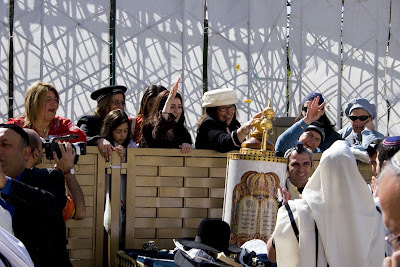 It also called the Wailing Wall, the Kotel, and "al-Buraq Wall" by Moslems. 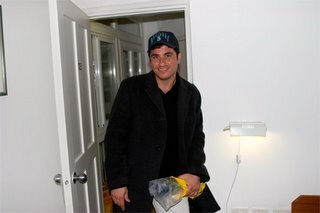 You should be able to click (or right click - open in new tab) on any of these pictures for a larger version with more detail. It is a western portion of a retaining wall that was used to keep the Temple Mount platform from spilling into the Tyropoeon Valley. The lowest parts of the wall may be from the early second temple era. 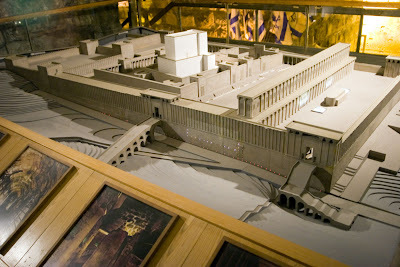 The main parts are from the time when Herod rebuilt the Temple and expanded the platform – around the time of Jesus' life. Romans destroyed the Temple and most of her walls in 70AD. Probably, this part of the wall was saved when it was covered with the debris of the upper walls and buildings during the Roman destruction. 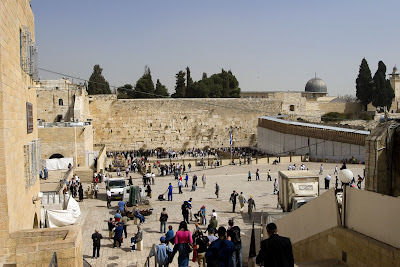 The upper parts of the current wall were built up during Moslem rule. You can see how this might have looked around 50AD. It would have been just to the right of the ramp in the lower middle. 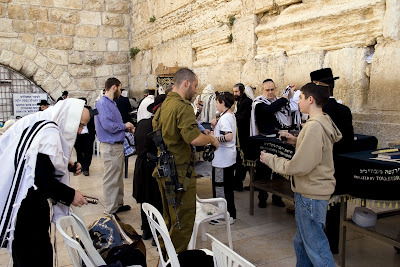 Men must cover their heads here; even non Jews. You can use anything, but if you forget a hat, you get to use one of these cardboard hats, that are a lot like a french fry tray and don't stay on your head unless you hold them on. I always travel with a hat in my bag. 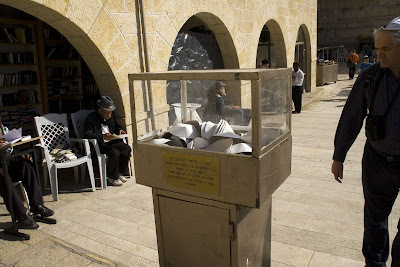 For Jews, this place is a sacred reminder of the Temple and the first Jewish nation. 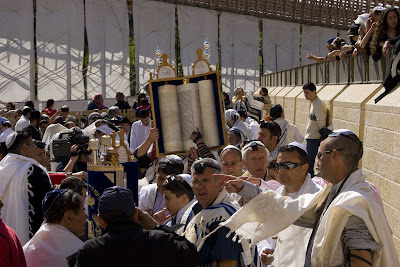 Many Jews will not go up to the Temple Mount itself – believing it must be purified before it is once again used for worship. 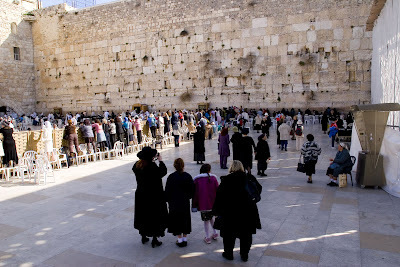 So, the Western Wall is as close as they can get to the site of the Temple. 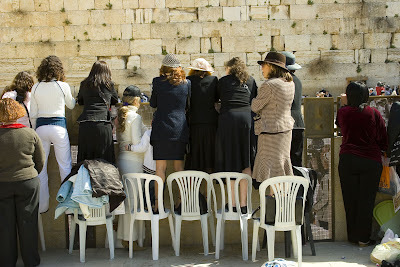 You will see that the wall is segregated by gender – women and men have separate sides. 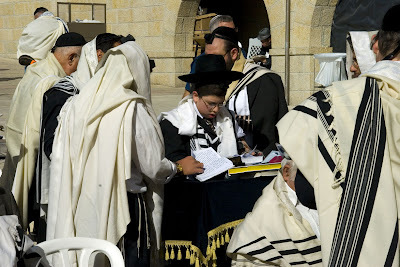 The Wall is a common place for the Bar Mitzvah, a Hebrew coming of age ceremony when boy must pray and read a portion of the Torah. Tuesday and Thursday are the most common days. Note that the women must observe from outside the men's area and often throw candy to the participants. Some people hire musicians for the celebration. These guys were pretty good. Look for the candy mid-air. I suspect that if any of these women caught me taking pictures of their posteriors, I would probably have received a handbag to the side of my head. 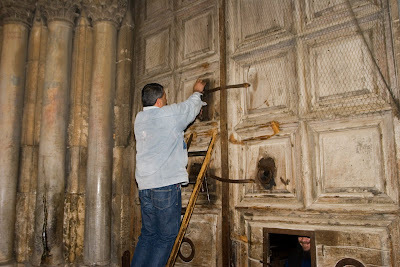 I have been asked about the ceremony of opening and closing the doors of the Church of the Holy Sepulchre. To be honest, in some way this shows us Christianity at it's worst. For centuries, different denominations have fought over control of this historic church. 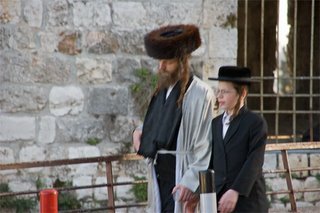 If you follow the news in Israel, about once a year you'll read about some fistfight breaking out between the priests two different denominations over some dispute of control or access inside the church. It's flat out embarrassing. These disputes trace back centuries. In the 12th century, to end the fighting, the Arab conqueror Saladin entrusted the key to the Muslim Nuseibeh and Joudeh families. 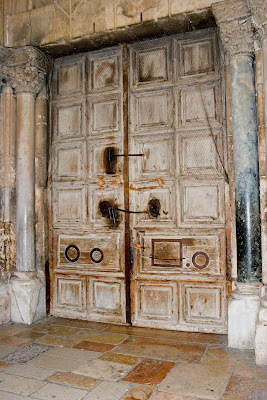 They are the only ones who can open and close the only door in and out of the church. Eight centuries later, the 10-inch metal key is still safeguarded in the house of the Joudeh family. 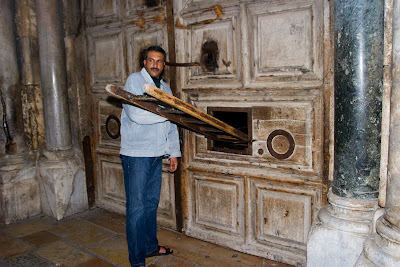 Every morning at dawn, Wajeeh Nuseibeh, who took over the job of doorkeeper from his father 20 years ago, picks up the key and opens the massive wooden church doors. Every night at 8:00 p.m. he returns to shut and lock them. 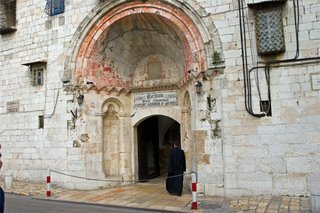 Prior to 1831 the opening and closing of the door was carried out by these families only after the payment of a tax which was abolished by Ibrahim Pasha in 1831. 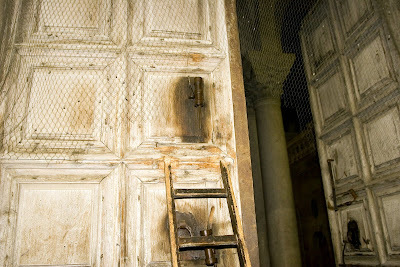 Muslim control of the key, however, does not mean Muslims control of the Church. 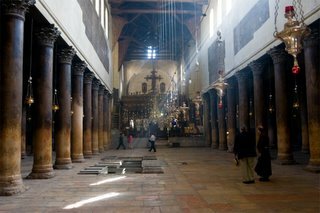 Greek Orthodox, Roman Catholic and Armenian Orthodox groups share the main control of the church, while the Ethiopian, Egyptian Copt and Syrian churches still maintain a presence in chapels and on the roof. If you want to go and see this, you may find that it's easier to get to the closing than the opening. It takes place about a half hour after sunset (get there a little before to be sure). As the closing begins, members of the different orders gather inside and make a few arrangements, like who will be there to help open in the morning. There are always people from each church locked in all night, along with some visitors. This will probably be my last post. Yesterday was a bit of an odd day. I went to a different hotel for breakfast to check it out as a place to stay when I come back with a group. After that, I roamed around a bit with my rental car looking for a place to do some laundry (I did find a spot). Yesterday was also the only day I haven’t felt very well. Something I ate must have disagreed with me. I’m feeling perfect this morning, so it must have been pretty minor. Yesterday afternoon, I met some people I have gotten to know over the internet. 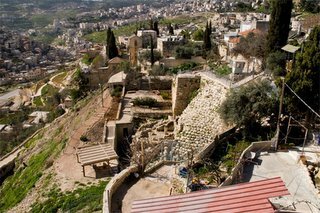 Todd Bolen teaches at a Master’s College Jerusalem extension campus and has taken literally thousands of pictures of Israel. He introduced me to Tom Powers who is an American ex-pat scholar who does volunteer work and is taking guide training. 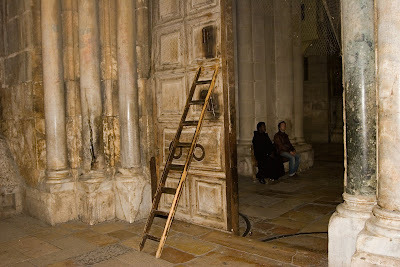 With a few other people, we did a tour of the Church of the Holy Sepulcher (Tom is somewhat of an expert on it) and then we all met an Armenian guide who gave us a tour of the Armenian Quarter – one of the more inaccessible parts of the old city. 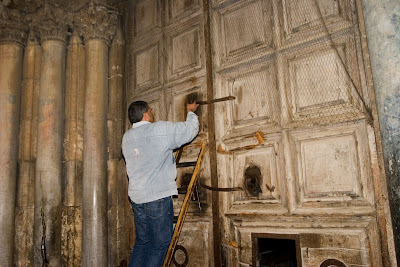 After that, he was able to get us into a normally locked chapel in the Church of the Holy Sepulcher that the Armenians control, called St. Vartan’s Chapel. 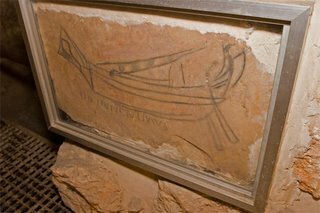 It’s a part of an old rock quarry, where on one stone someone has drawn a Roman ship and left an inscription. It dated to the 3rd century. It could be one of the earliest signs of pilgrims coming to the area to area to worship; it could also be common graffiti. Still, an interesting place few people get to see. I had planned on one day of rain during my visit and got none, so I find myself on my last day having seen all I planned to see and ready to be heading home. It is cloudy today. I’ll wander leisurely today and get packed up. I have to leave here at 2:30am (aghhhhhhhhh) to be on time for a 5:45am departure. This is when saving $300 of airfare doesn’t seem worth it. I both shoot and collect guns, so I’m not bothered by the sight of firearms. 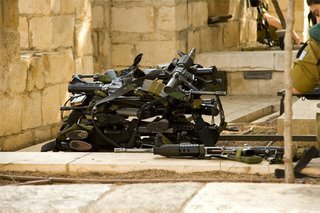 Still, I’m always amazed here at the amount of firearms that you see in public. 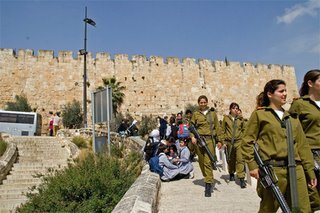 Soldiers on guard, police, special guards with groups, and sometimes average Israelis. 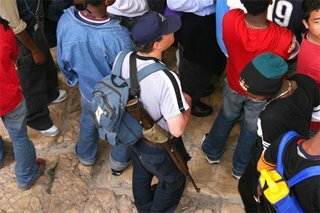 If you are nervous around guns, this isn’t the place for you. It’s a reminder that in many ways this nation is still at war. Frankly, you might not otherwise know it. I wonder if terrorism continues to expand in our world how long it might be before we see these scenes in the USA. Not so much to report today. I took my rental car on a road trip. I’ll spare you most of the details, but driving here isn’t my favorite hobby. There seems to be some Jewish law against street signs. That I got to where I was going and back owes a great deal to luck. 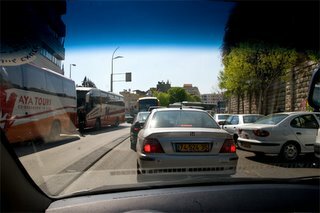 I drove to Nazareth, Megiddo, and Sepphoris. Eventually you see the pictures show up in sermons and classes. That would be cars not moving. On the flip side, Sepphoris is a little visited site of a 1century Roman/Greek town that is just over the hill from Nazareth. 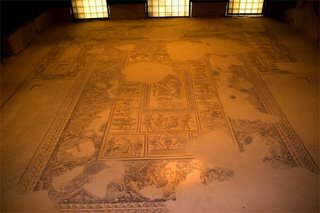 The homes were filled with beautiful mosaics. I think it likely that both Jesus and his earthly dad worked here. Interesting to see the ruins of houses God’s Son might have helped build. Another day of many stairs. 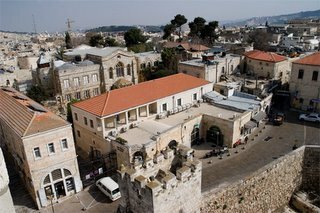 My guesthouse is right near the Jaffa Gate (see picture). It just about the highest part of the old city. 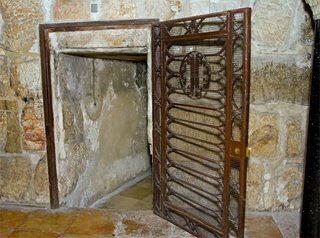 The tunnel Hezekiah had dug from the Gihon spring is at just about the lowest part. So, today I went from my hotel and toured the City of David excavations all the way to the tunnel. Historic Jerusalem from top to bottom. Then I had to climb all the way back. More stairs than I ever want to see again. It was tough watching the tour groups get dropped of at the entrance and see their busses waiting to pick them up at the bottom. Not as many people pictures today, but a few with some reflections. I am a proud father of girls, and as such I sometimes see the world through the eyes of a father. 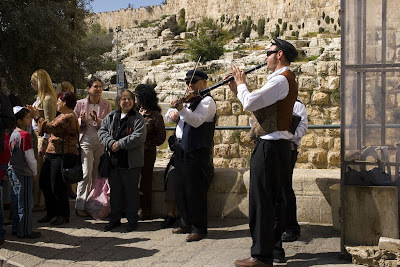 In Israel there are two main groups of people: Jews and Arab/Palestinians. 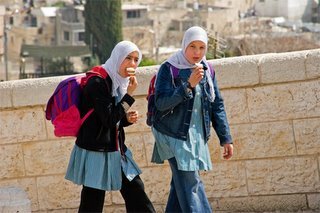 Arabs who live in the Jewish state are often citizens, but tend to be treated as second class citizens. The two live very separate lives in most places. 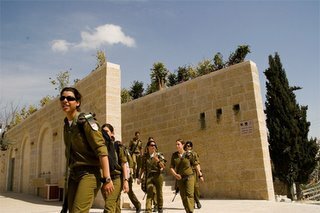 All Jews serve in the military after they graduate from high school. 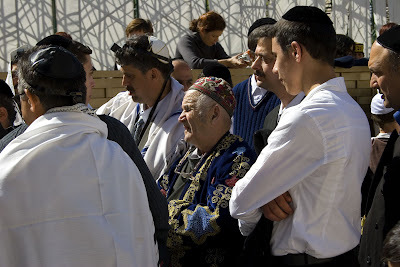 Part of the training is to take them to historic location and to be sure they know their Jewish history. 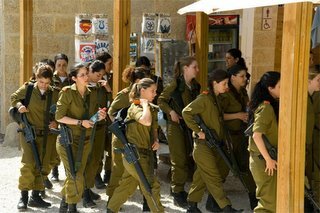 So you often find groups of young soldiers in training at some of the places you visit, in uniform and armed with M-16s. It was strange to see these two groups side by side. Two peoples, sharing the same country, but having such different lives and futures. Maybe that's how people from outside the USA see the lives of whites and blacks when they visit us. I can only imagine how their fathers worry about them. Thanks for looking. I’ve had a few notes of concern from people who heard there was a riot here. In a place known for weird stuff, this was weird. 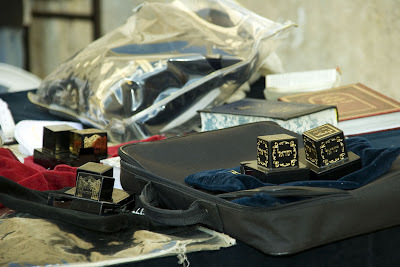 Apparently, a Jewish man, his Christian wife, and another woman went into the Church of the Annunciation in Nazareth. He started throwing firecrackers and panic ensued. Local people heard the explosions and commotion and ran to the church. The situation developed into a near riot. It’s interesting to hear how this is interpreted here. 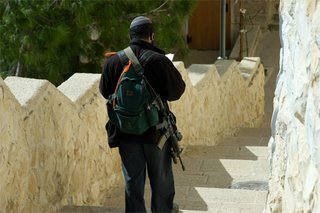 The Palestinians whom I talked to about this referred to the man as a “Jewish terrorist”. 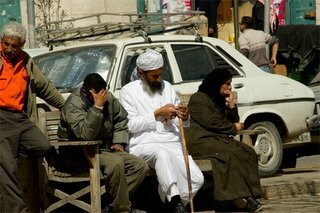 The Israeli media talked about him as a man with “emotional problems”. I suspect it’s true that had this man been an Arab, he would have simply been called a terrorist. Such is the underlying tension of the people who live here. On the other hand, I spent most of the morning in Bethlehem – an area controlled by the Palestinian Authority and had no problems. There were far fewer people pestering me to “come to my shop” or “do you need a guide”. Taxi drivers were polite, friendly, and gave reasonable fares for the trip there and back. I was a little nervous about being there on my own, but I had zero problems. However, one very politely talked with me about how much most people in the Middle East hate George Bush and are upset about the daily killings in Iraq. He was quick to point out that they did NOT hate individual Americans, just what our country has done. I would have mentioned that all these people are being killed by Moslems, but I’ve learned to never argue with a taxi driver about politics. We live in a complicated world and they live in a far more difficult one than I do. 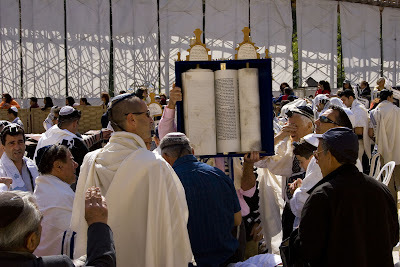 Today was the Jewish Sabbath. 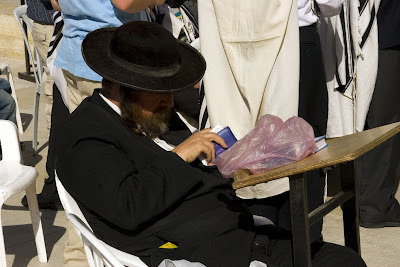 I saw lots of Jews in just about every variety you can imagine walking about in their Sunday best. I must have heard them speaking a dozen languages. I sat in a square for 30 minutes and watched families walk by; children playing in the square while parents visited with friends as the Sabbath was coming to a close. I wonder if we couldn’t learn a thing or two from them about using God’s day of rest wisely. 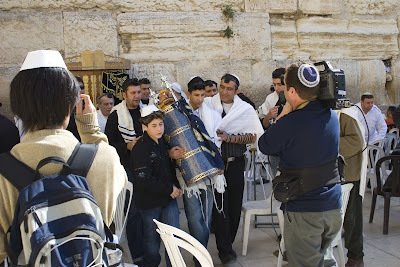 Jerusalem and Bethlehem are places we read about in the Bible; ancient, historical places that remind us of Christmas pageants and seem unreal. But they are also living 21st centuries cities, with people who want all the things in life we do. The mix of old and new always amazes me. 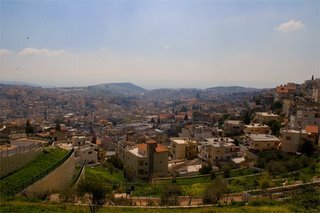 To actually live in the town that David took for his city, where Pentecost happened, or where Jesus was born boggles my mind. For the people here it is simply a part of the rich heritage of their lives that we can barely understand. 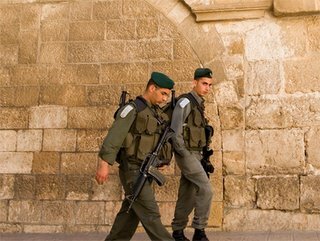 Soldiers patrolling outside the Church of the Holy Sepulcher (seemed like there were more today). 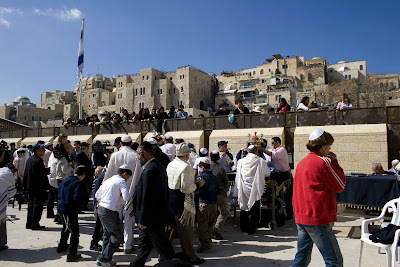 Jews heading into the Old City. 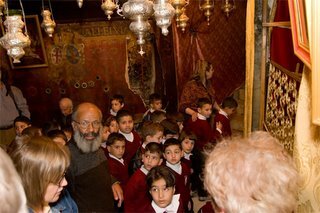 Palestinian schoolboys in the grotto of the Church of the Nativity in Bethlehem, crowding to touch the place where Jesus was born. A Palestinian sitting in Manger Square. 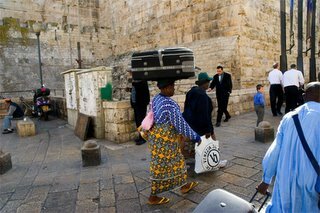 An African pilgrim on her way to her tour bus with luggage. 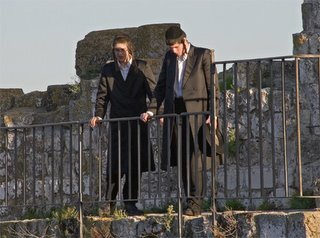 Two Harindi (ultra orthodox Jews) young men standing on the top of the city walls. 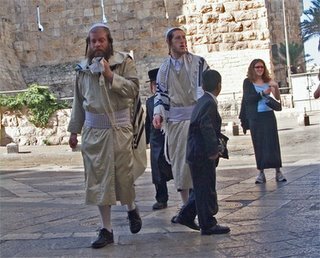 A little blurry, but a Jewish man and son walking in the Jewish quarter. Finally, the nave of the Church of the Nativity, re-built in the 6th century and standing much as it was then. Amazing place. Thanks for looking.